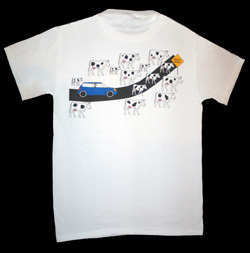 This t-shirt shows a scene which is familiar to our rural and pastoral friends. In areas of the country where there are "Open Ranges" or the occasional hole in the fence, a driver may often be faced with a bovine obstacle, which can significantly impede their progress. 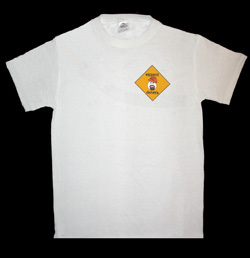 The Cows in Road T-Shirt is screen printed on a Delta Magnum Weight white t-shirt which is 100% cotton with the eXpect delaYs logo, featuring "Gus", on the front over the left upper chest and the large graphic of cows blocking the road on the back. It is difficult to appreciate the quality of a t-shirt without actually seeing and feeling it, but our shirts are well made, with screen printed bright colors, and a nice feel and a comfortable to wear weight, which is not too thin, but not so thick that it is uncomfortable to work out in. If you would like to feel a t-shirt before you buy, Delta t-shirts are are fairly ubiquitous, and you may even be able to find one in your own closet or nearby store. If you are not satisfied with the quality of the t-shirt, you may return it before wearing or washing it, as per our return policy.